The DTRA 2019 season kicks off on the weekend of April 13th and 14th, with Round 1 of our Nationals and Hooligans championships at the Adrian Flux Arena, King’s Lynn. It’s become something of a tradition to hold the season opener at this track as it’s a firm favourite among our veteran riders, which really sets the tone for another great season of racing. Whether you’re joining us for your first-ever races, returning for another year or just want to come along and spectate (for free), here’s everything you need to know. First things first, if you want to race in this round (and have already joined the DTRA), you MUST sign up – and pay – in advance for each class you wish to race in. Sign up for the Nationals and Hooligans Round 1 here. Race entries close at midnight on Friday 5th April. If you need to be reminded of how entry fees work, take a look at our 2019 Entry Pack and Class Regulations. The track at the Adrian Flux Arena is longer than the average UK short track, and has a consistent surface when it’s kept well-prepped by the team, although the shale surface does tend to groove up after a few heats. It’s floodlit which makes for some awesome night-time racing, but we won’t be running races too late into the evening this year. The Adrian Flux Arena has exceptional facilities for all types of guests. Here’s what you’ll find at this track. While there isn’t much in the immediate area around the track, there are hotels, supermarkets and restaurants (mainly fast food) situated within a few miles. Below are some nearby places that you might find useful – it’s worth mentioning that the track is only about five minutes’ drive from King’s Lynn town centre too. We can’t guarantee the weather, but it’s good to know what the weekend has in store for us. Keep an eye on the King’s Lynn weather forecast below so you know what gear to pack. In case you’re wondering, we only ever call off races if the weather forecast is exceptionally poor. We appreciate that many of our riders have long distances to travel to races, so if a race needs to be called off, we always aim to make the announcement in plenty of time beforehand, and attempt to schedule a rain date after the end of the season. So that should (hopefully) be everything that you need to know about Round 1 of the Nationals and Hooligans championships. If you have any further questions, PLEASE check the information on the Nationals page of the DTRA website first to see whether your query is answered there – otherwise, please just drop them an email at info@dirttrackriders.co.uk, or message them on Facebook and we’ll get back to you as quickly as we can. Don’t forget to follow them on Instagram too, and of course keep checking this blog for photos, videos and updates throughout the racing season. To all riders and spectators, travel safe, and see you at the races for the start of what will surely be another awesome year. Feature Team Report. 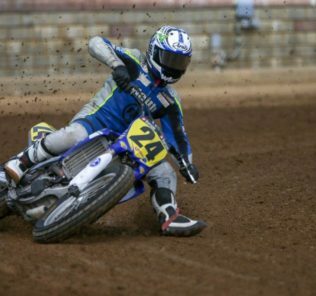 Greenfield Dirt Track become home track heroes at Flat Track National finale!